For knowledge add a little every day, for wisdom erase a little every day. I learn as much from a turtle as from a religious text. Acquire knowledge, it enables its professor to distinguish right from wrong; it lights the way to heaven. It is our friend in the desert, our company in solitude and companion when friendless. It guides us to happiness, it sustains us in misery, it is an ornament amongst friends and an armour against enemies. The most fatal illusion is the settled point of view. Life is growth and motion; a fixed point kills anybody who has one. Any piece of knowledge I acquire today has a value at this moment exactly proportional to my skill to deal with it. Tomorrow, when I know more, I recall that piece of knowledge and use it better. A life without change is not a life; it is a stagnant pool. To change your mind frivolously is a cop-out. To change your mind under the direction of the wisdom of the heart is a brush stroke on the masterpiece you are delivering to the world. – Alan Cohen, "Dare to Be Yourself"
In today's rapidly changing economy, the key to success is not what you know, but how fast you can learn. Your outer world of results will always correspond to your inner world of preparation and learning. 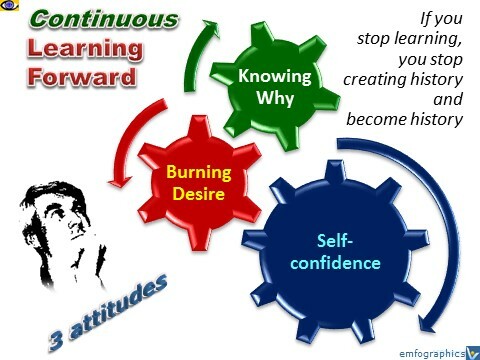 Life is about continuous learning, discovering new things, and growing. Successful people don't think they know everything. They are open to new ideas. They are always willing to find another way, find a better solution. That's why they're successful. Don't think you know everything and be open to learning and trying new things if you wish to achieve more, create new things, grow, be successful and live the life you want. "I'm always doing that which I can not do, in order that I may learn how to do it ." Having eyes and brains is not enough, you must know how to use them. Lifelong learning is learning in which you engage throughout your life. It includes both formal and informal education. As new know knowledge is created and disseminated increasingly faster, terminology and definitions of lifelong learning (LLL) have developed in line with the shift of emphasis away from the system (in lifelong education) to the learner (in lifelong learning). A constructivist learning environment is a place where people can draw upon resources to make sense out of things and construct meaningful solutions to problems. It emphasizes the importance of meaningful, authentic activities that help the learner to construct understandings and develop skills relevant to → solving problems . Experiential Learning: Experience as the Source of Learning and Development, Kolb D.A. A dynamic theory of organizational knowledge creation, Nonaka, I.